The University fosters leadership development through a variety of experiences intentionally designed to inform and enhance a personal and collective understanding of Barry’s Mission and Core Commitments. As Catholic institutions of higher education prepare for the diminishing presence of men and women vowed religious, it is important to consider how mission in the Dominican tradition will be cultivated on our campuses. Developing tomorrow’s leaders becomes critical to sustaining the vision and mission of Barry University which flows from its Adrian Dominican foundation. All students, faculty, and staff are encouraged to participate in these annual activities, events, lectures, luncheons and mission trips. Specific programs and events are posted on the University training calendar and can be used for professional development. 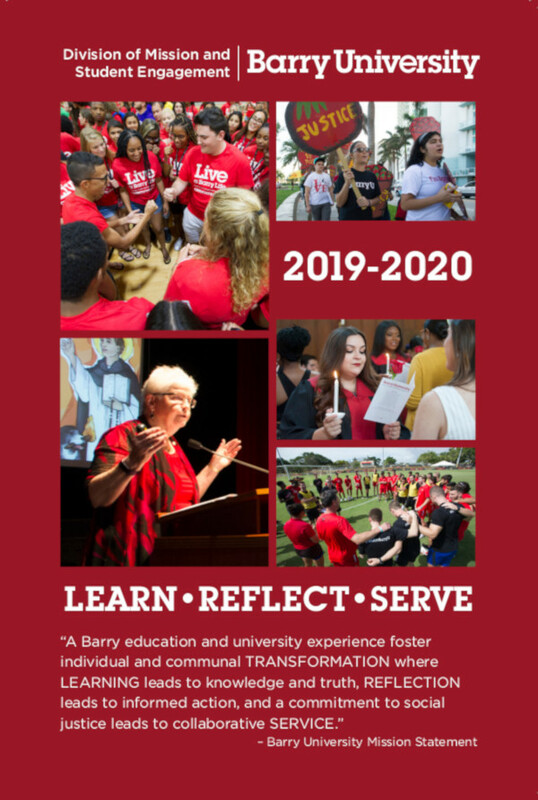 Barry’s Learn-Reflect-Serve programming provides an overview of the mission centered programs and campus traditions across the university for fall and spring semesters. We hope you will join us in taking advantage of these experiences and opportunities.